Th1: Th1 pathway is not involved in SLE. Hence, CRP is not elevated in SLE flare up. If CRP is increased, then it likely could be infection and not SLE flare up. 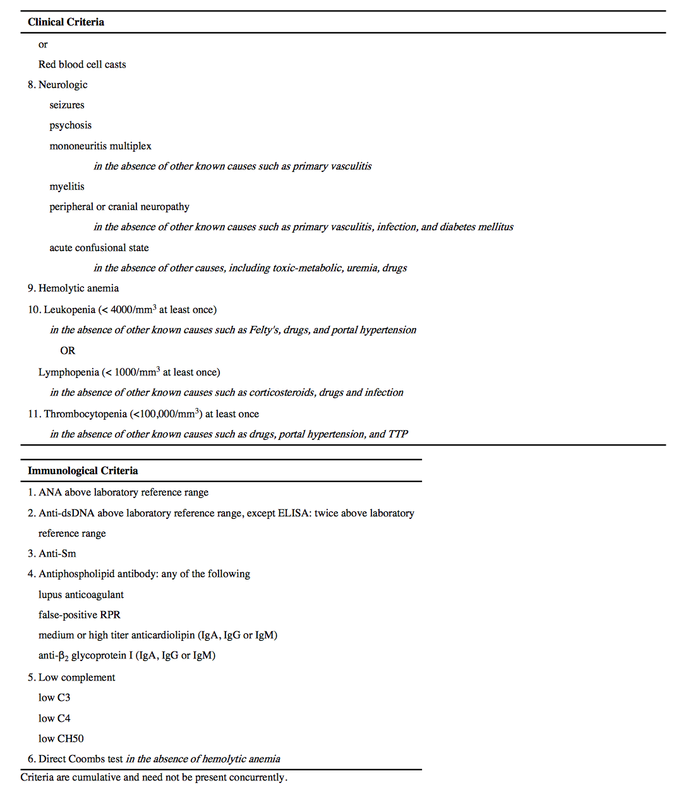 26 yo F with SLE, SLE nephritis (mesangioproliferative), has low C3, Low C4. Anti-smith was positive. Anti- DNA is 1: 320 (used to be 1:640). Had been on chronic steroids and has bilateral hip pain due to early AVN. Was on Cellcept, which was discontinued due to pancytopenia. Thiopurine Methyltransferase level is 22.2 (normal: 25-65). How do you manage the patient. She has had sub-acute skin lesions as well. You diagnose the paitent with moderate activity of SLE. She has received BCG vaccination as a child. 4. IFN -gamma release assay to consider starting her on Biologics. Inhibit cyclooxygenase 2 and inducible nitric oxide synthase. Used for all features of systemic lupus erythematosus. Inhibit cyclooxygenase, types 1 and 2. Used for fever, serositis, and arthritis. Thus inhibits Antigen Processing and Co-stimulation activation. Used for arthritis, skin rashes, and fatigue. Might have a useful role in nephritis, have antithrombotic properties, and reduce cholesterol concentrations. Retinal deposits is dose and duration dependent. Forms active alkylating metabolites (4-hydroxycyclophosphamide, phosphor amide mustard, and acrolein). Prevents division of the cells by cross-linking DNA and suppressing DNA synthesis. Purine analogue that suppresses DNA synthesis by inhibiting synthesis of xanthylic and adenylic acids. 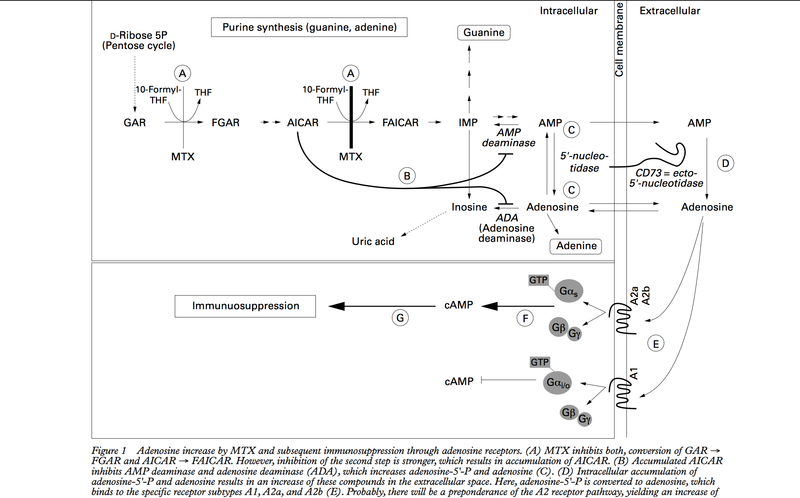 Metabolised by metabolism involves the enzyme thiopurine methyltransferase (TPMT). Consider testing for TPMT activity prior to initiation of Azathioprine. Metabolites cleared by Xanthine Oxidase. Hence, Xanthine Oxidase inhibitors (i.e Allopurinol, Fuboxostat) are relatively contraindicated when using Azathiopurine. A folate antimetabolite that inhibits DNA synthesis. Binds to dihydrofolate reductase, resulting in decreased purine synthesis and cell proliferation. Forms complex with cyclophylin that disrupts the activation of calcineurin (complex of pho sphatases). Inhibits production of interleukin 2 and arrests T-cell cycle between G0 and G1. Toxic medications. Hence, used as 3rd line agents in most illness. Mycophenolate (mycophenolic acid as active metabolite) inhibits monophosphate dehydrogenase and blocks synthesis of guanosine nucleotides and proliferation of T and B cells. Inhibits dihydroorotate dehydrogenase necessary for pyrimidine and cellular protein kinases synthesis. Has immunosuppressive and antiviral effects. Response to vaccines is suboptimal in Rituximab, and Abatacept. Use of all vaccines prior to initiation of these agents is suggested. 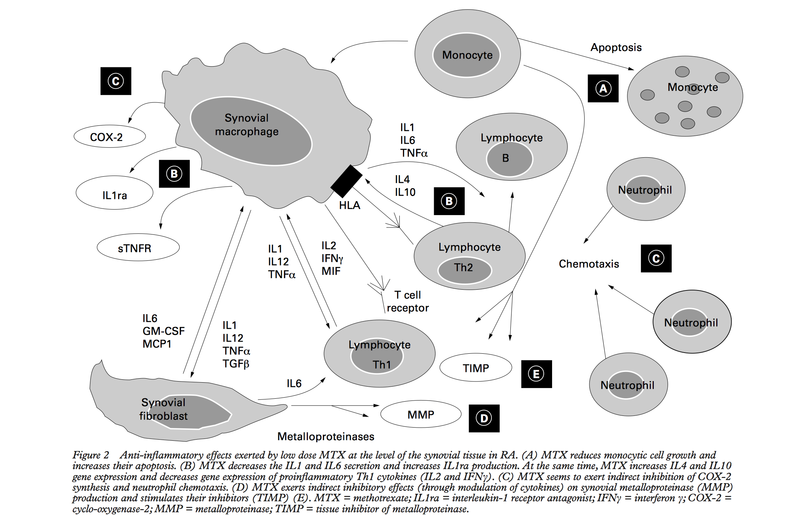 The ‘cytokine shift’ hypothesis proposes that pharmacological systemic blockade of TNF-alpha suppresses production of Th1 cytokines, thereby driving the immune response towards Th2 cytokine production, IL-10 and IFN-alpha. This change in cytokine balance would then induce a cascade of downstream events ultimately resulting in production of the autoantibodies and a lupus-like syndrome. Another hypothesis is based on the assumption that systemic inhibition of TNF-alpha could interfere with apoptosis, affect the clearance of nuclear debris and thus promote autoantibody production against DNA and other nuclear antigens. Similarly, TNF-alpha-induced apoptosis of mature cytotoxic T cells is an important mechanism for termination of T lymphocyte-driven responses. Anti-TNF-alpha therapy may interfere with this process and thereby promote autoantibody formation against nuclear antigens. Alternatively, inhibition of cytotoxic T cells by anti-TNF-alpha therapy could reduce the elimination of autoanti-body-producing B cells. Some nuclear antigens, namely nucleosomes, become detectable in the plasma of RA patients after the start of anti-TNF-alpha therapy. Interestingly, such a rise in plasma nucleosome levels might contribute to a break of tolerance and thereby induce autoantibodies in susceptible individuals. This notion is supported by a recent study, which found that the occurrence of anti- nucleosome antibodies correlated strongly with the presence of ANA in anti-TNF-alpha-treated RA patients. 45 yo M patient is seen for Acute on Chronic Renal Failure. CMP is as follow. Spot Ur-Pr/Cr is as follow. Patient was diagnosed previously of SLE with Nephritis. Unknown what pathological diagnosis patient had. 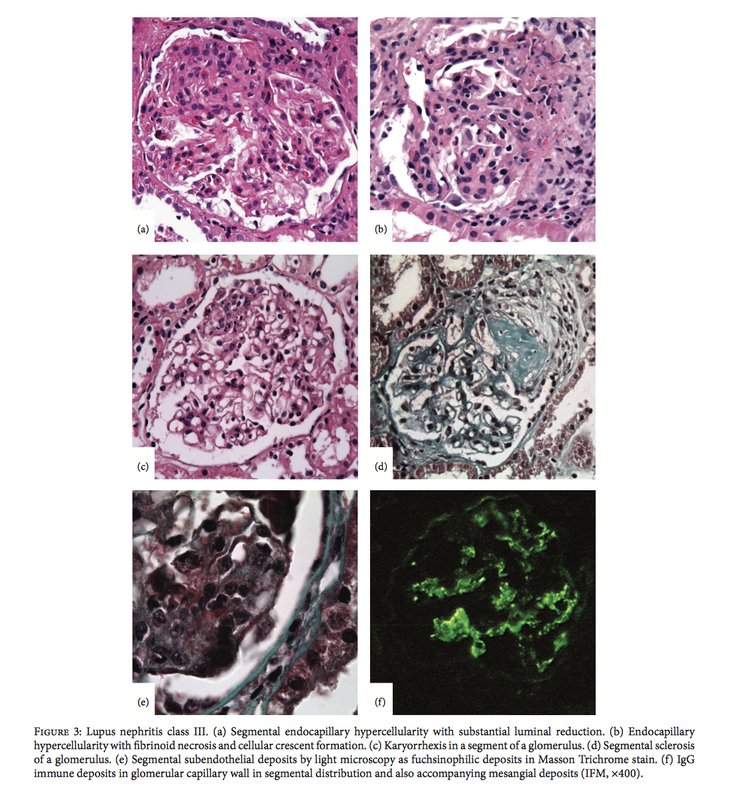 However, was on Cellcept since diagnosis of SLE with Nephritis in 2014. Rheumatological work up revealed the following. Renal Biopsy is Done because of the worsening AKI. 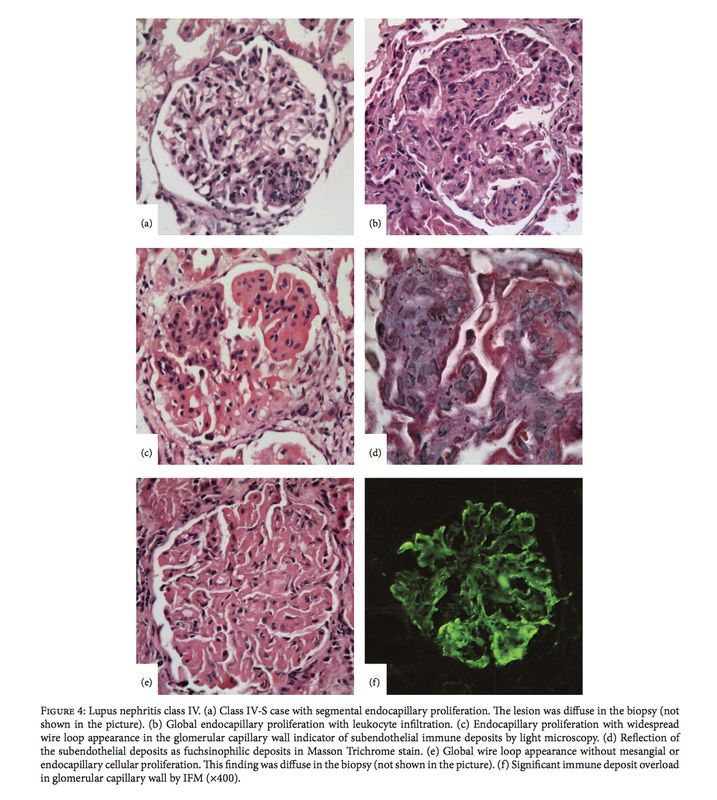 Before we discuss the findings of the biopsy, what are the renal manifestation of SLE? 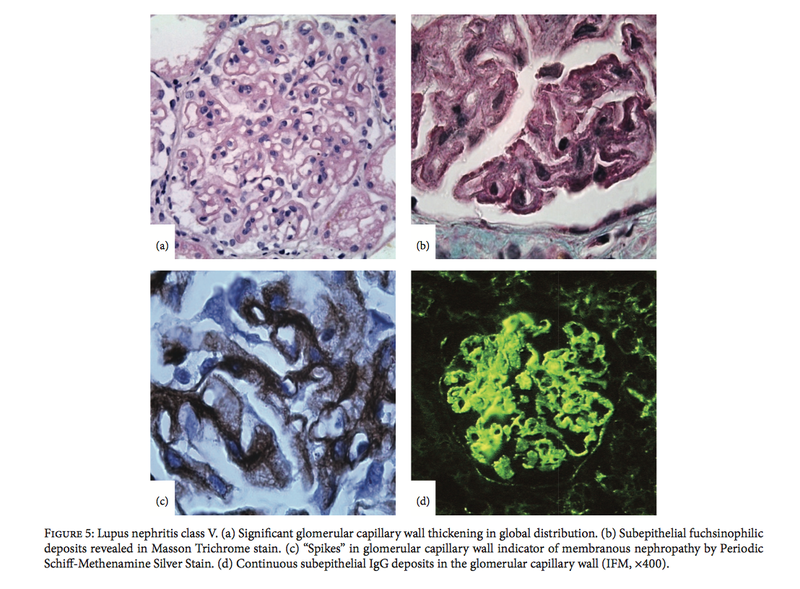 Given the current patient finding, what kind of Nephritis would you expect. Biopsy came as Lupus Nephritis Class V. Why is this unusual. 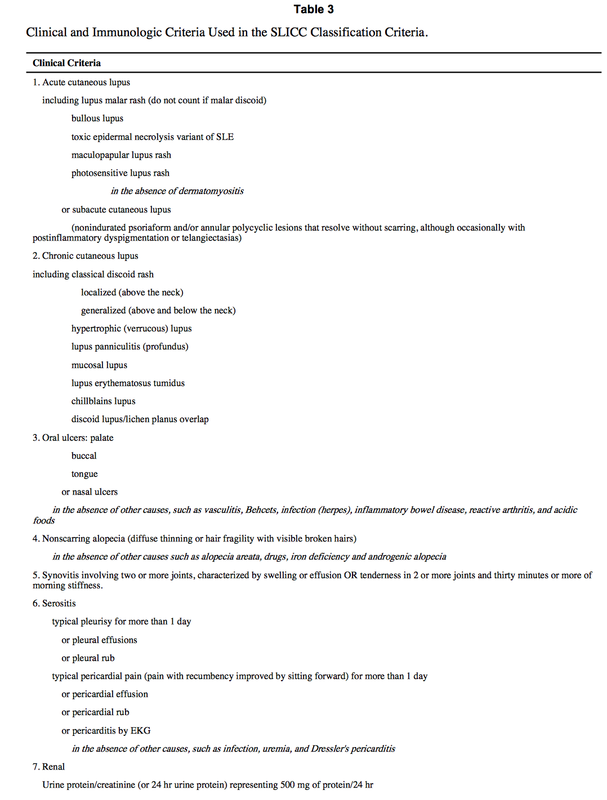 How is Lupus Neprhitis treated for Type III, Type IV, Type V.